Soon I’m watching 24h movies in the cinema. And yes, you read that correctly because I’m going to watch all the Harry potter movies so 24h in the cinema. I saw that they are doing that… So I though why not? 😉 Of course I’m already preparing everything because 24h in the cinema is not nothing… So I’m going to take a blanket with me for sure and also a face mist. That way my make-up can survive longer than 24h and will still look good. The face mist that I’m going to take with me is one from the body shop. 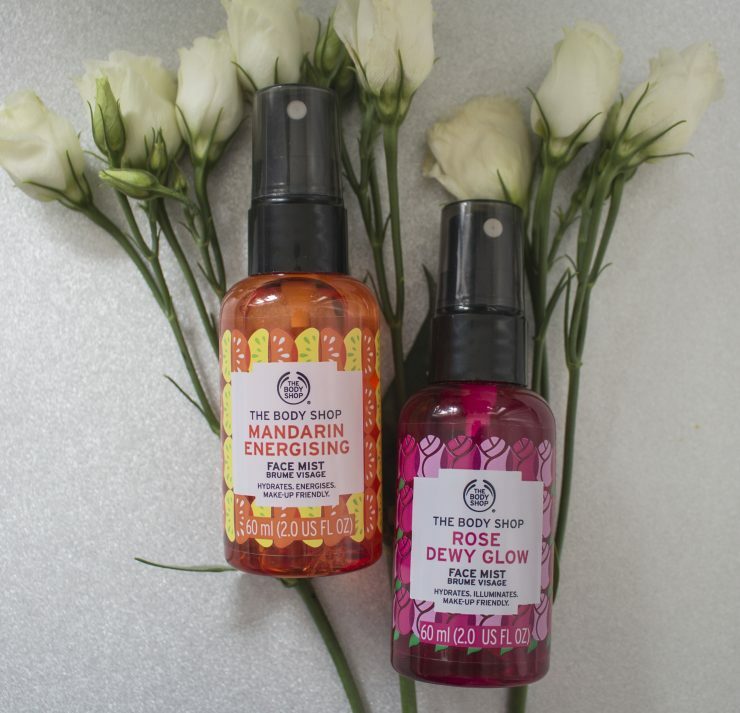 I have two; mandarin energising and rose dewy glow. So let’s tell you more wherefore these face mists all are good for. You can use these when you aren’t wearing any make-up, but you also can spray them over your make-up. The face mists have a handy format to take with you. Also the packings looks so cheerful and nice! The body shop have 5 different kinds of face mists with all a different working, but what they all have in comment is that they hydrates the skin. Another nice fact is that all the face mists contains biological Community Trade aloe-vera from Mexico. They pluck these with the hand. So that way you know that the aloe-vera is from amazing quality. This is a face mist that contains raspberry essence and cherrywater from France and community trade rose essence from England. The smell from this is just like of different soaps from back in the days. I personally don’t like the smell, it a smell that you love or you hate… But the face mist does what it promises to do. It works amazing, hydrates my skin and let it feel good. These face mists work amazing, they hydrates and refresh the skin. Also are they very handy to take with you. All the face mists have a different working, but personal I find the mandarin one amazing, this is also my favorite. I find it a good an addition to the assortment from the body shop because it are fantastic products! Price: these face mists cost €8 (60ml) each. Ja, deze zijn echt top!